Sensata's IELR Series Rail Mount Hydraulic Magnetic Circuit Breakers » HHP Associates, Inc. Designed specifically for the 35mm symmetrical DIN rail, Airpax IALHR, IULHR and IELHR series rail mount magnetic circuit protectors offer the advantage of quick and easy mounting or removal which results in efficient and economical wiring, while conserving space. These circuit protectors are available in 1, 2, 3 and 4 pole models, with a choice of handle colors with on/off and international I/O markings. These protectors comply with UL and CSA standards and meet IEC and VDE spacing requirements. Typical applications include computers and peripherals, telecommunications, medical equipment, machine tools and process control instrumentation. They provide the reliable performance associated with magnetic circuit protection. Mounting – These circuit protectors are designed to mount on standard 35mm DIN rails, such as 35×7.5 or 35×15 per DIN EN50022. Other specialty rails are available from suppliers that provide a means of mounting non DIN mount components by means of special captive jam nuts. See IELR Series datasheet here. The most popular configuration for magnetic protectors is the series trip where the sensing coil and contacts are in series with the load being protected. The handle position conveniently indicates circuit status. In addition to providing conventional overcurrent protection, it’s simultaneously used as an on-off switch. In the event that over-current protection is not desired, the coil mechanism can be deleted, providing an excellent low cost, single or multi-pole power switch. 100 megohm minimum at 500Vdc between all electrically isolated terminals. 3750Vac (3750V~) shall withstand AC voltages 50/60Hz for 60 seconds between all electrically isolated terminals. 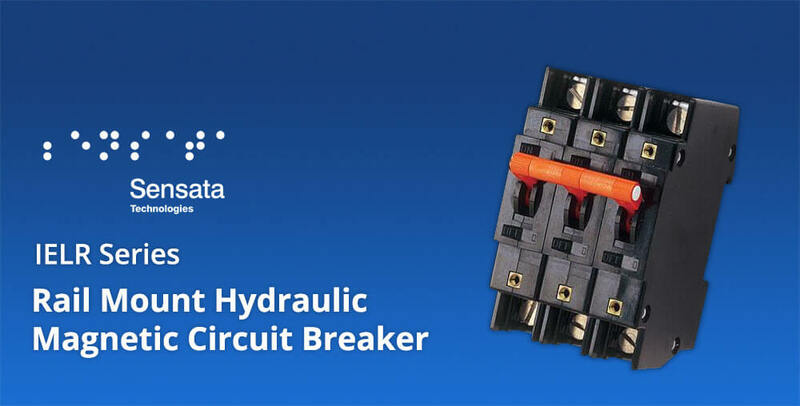 Circuit breakers shall operate a minimum of 10,000 operations; 6,000 with rated current and voltage and 4,000 with no load. 10 days, 95 percent relative humidity at 40°C in accordance with IEC68-2-3, test C.
Five percent solution at 35°C in accordance with IEC68-2-11, test K, 48 hours. 50g, 11m sec, half sine with rated current, except no current with handle down. Instantaneous units use 80 percent rated current. Test in accordance with IEC68-2-27, test Ea. This assumes that adequate end stops are used to prevent longitudinal movement of the circuit protector. 4g, 5–500Hz (maximum double amplitude displacement 1.5mm) with rated current except no current with handle down. Instantaneous units use 80 percent rated current, in accordance with IEC68-2-6, test F, method A, one hour per plane. This assumes that adequate end stops will be used to prevent longitudinal movement of the circuit protector.